One stormy day, the horses got scared by the thunder and run away. The girl, who jumped on a horse’s back, found herself and the herd on an unfamiliar place, far from the village. But the place was beautiful and a proud stallion sat in front of her and welcomed her to the wild horses’ land. The girl was happy to live among them but the villagers found her and brought her back home. Soon after her arrival, she fell ill. Finally, the villagers realized she was missing her horses and let her go. Years later, they tried to see her again but they couldn’t find her. 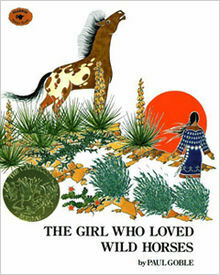 They said she had become a wild horse herself. Illustration: Paul Globe is also the illustrator of this book. His drawings are very vivid with accent elements to draw attention to the story line. The colors are vibrant and pure. The village is very well depicted and the nature is full of life.